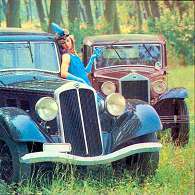 My name is Daniel POTTIER and I am the President of the French Lancia Club. Our Club was founded in 1980 at the geographical centre of France, SAINT AMAND, MONTROND, one can easily realize the importance of this foundation, France as everyone knows, being the centre of the universe. The megalomaniac instigator of this event is still alive and is named Pierre François CROZE, he immediately took the Presidency, of the five member club. He was helped by Yves KETTERER also known as PAPA LAMBDA. The universal plot was set, and you now know the consequences. 17 years and a few revolutions after, the LANCIA CLUB FRANCE has perverted more than 300 Lancisti, not only French ones, British, Belgium, Austrians, and even Helvetians have chosen to enter. They made this choice in order to satisfy 3 passions: Lancia, Food and Wine. For LANCIA, they own more than 500 cars from LAMBDAS to INTEGRALES and it seems quite easier to have a working LAMBDA than a functioning BETA. The most common cars of the pre-Fiat era in the CLUB are the FULVIA then the FLAVIA. Many Betas are now joining, for their owners find difficulty maintaining such a car. A newsheet called LA LETTERA is sent out every month, it is considered by some as the most subversive club newsletter in France because freedom is demanded for the Lancia drivers, this happens usually twice a year, when the Editor has been fined. 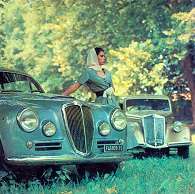 The LANCIA CLUB FRANCE, unfortunately, does not have a spares stock or a program of refabrication, due to many previous unlucky experiences. In counterpart members buy and sell a lot through the "petites annonces" published in the LETTERA. RETROMOBILE in February where 2 cars are displayed and a bar opened for 10 days. A Rally in NORMANDY in April, this is a one day event and is organised alternatively by G BOURDON and I. Le Grand PRIX de l'AGE d'OR. The Club has a stand and provides a picnic on Saturday and Sunday. A dinner is organised on Saturday evening. The ANNUAL RALLY in September gathers around 45 cars for a 2 day event in *** hotels and restaurants. We also organise special events when circumstances allow or demand such. Two years ago we had the FULVIA COUPE 35th Anniversary and last year LANCIA 90th Anniversary in RHEIMS with a very international attendance. We enjoy being together, and drive Lancias.